The past 3 times our office has rented from here, there has been the same mysterious bumper "damage" that is a light scratch that you can only see from a certain angle. Even though it is superficial surface pre-existing damage, we have been forced to go through our insurance company to have this resolved. This is our last time renting from this scam of a business. Also, the staff member I was speaking to was very rude and condescending, accusing me of having an accident. I find this very offending, considering I have a spotless driving abstract, with not so much as a parking ticket. I initially rented a car through a competitor and they were less than helpful, especially when I had come a very long ways to rent a vehicle. The ladies at this location were superb! They definitely made my day and my young daughter, who unfortunately had to wait with me through a very cold and rainy day to rent a car. The shuttle driver was so kind and pleasant to talk to and the ladies in the location were polite and friendly and very courteous. If I do come back to Sudbury, I will be sure to rent from the Kingsway location. Thank you ladies! What an amazing experience we had! Kudos in particular to manager Laura! We encountered an unexpected problem with the credit card we were using to rent the car but she went out of her way to make sure our weekend plans were saved! The car we got was a new, clean Nissan Sentra with all the bells and whistles! What a great price for three days! And dropping it off couldnt have been easier! I wasnt even late for work that morning! Thanks so much for a great weekend! We couldnt have had our getaway without you! Never had any problems with this location till new management. Noone picks up phone, they change their hours in the fly resulting in general reservations being missed and canceled. You book online or on phone and then show up and they are closed or open you dont know. Rates are competitive with others and they include more km usually. Their pick/drop off is handy. Disgusting. Horrible service 1. Found drugs and scale in the glove box 2. Found a dirty suitcase full of old underwear in the trunk 3. Third car I rented Was drenched in the smell of nicotine. Absolutely disgusting They do not clean theyre cars and they really dont take care of theyre customers. I do not recommend. Horrible experience; The rep gave false information. Left there without a vehicle!! The reps name was Melanie Bedard, and it says Assistant Manager on her business card! Anyhow, very disappointed with her service, professionalism, customer service skills and general attitude. Will not visit this location again. I just came back home after an amazing experience with Enterprise Ren-A-Car from Sudbury. The car was very reliable, easy on gas, and a very good car. I am in love with the car I had from them. Planing to buy my next car as I rented, "Dodge Charger" the best so far I had. Thank you Enterprise! I asked to return my rental early in the morning because I got back late in the evening one day earlier, sooner than I had expected, so I knew the rental would be sitting in my driveway all day for nothing. They wouldnt accept my request. 100$ wasted there. Poor customer service in my opinion. Was told they would pick me up at work at 5pm. Left me stranded outside waiting until almost 6pm. Now Ive been waiting almost a month to get my $100.00 deposit back, which they conveniently keep saying that "its on its way". Never going with this company again. Always excellent service and sometimes you get free upgrades. Book in advance and hope they sold out by the time you go in. Can we interest you into something bigger and better? Yes please!!! 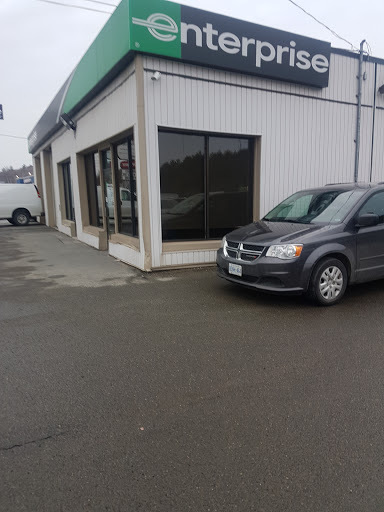 This is the best rental car company around, the kingsway location in sudbury the team is fantastic!!! !, great Job ladies and gents keep up the good customer service. I have been renting from this location for several years. Service has always been top-notch. I wouldnt hesitate to recommend them to friends and colleagues. Amazing customer service the employees are so nice and always there to help you as soon as you walk in. This place is worth of five star! Not too bad a place for a rental, though I dont think any of gheir vehicles had Winter tires...and this is Sudbury. Excellent,always very professional and considers the customer first .